The geothermal systems in Yellowstone National Park are field laboratories for scientists seeking to understand the origin and evolution of metabolic processes necessary for life in extreme environments, particularly in the microbial mats found in hot springs. Results: Our oldest national park may hold answers to questions about the activities of microbial communities that, in turn, may help in developing bioenergy technologies or safely storing carbon dioxide. 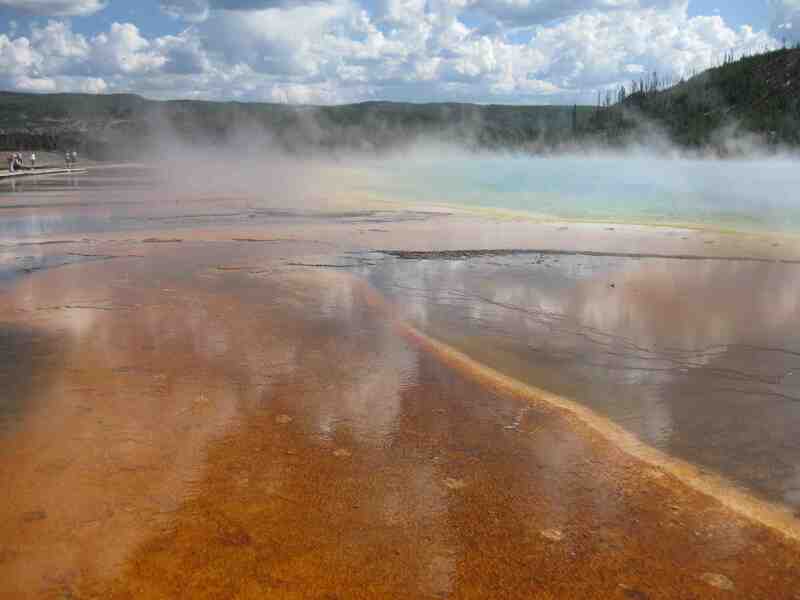 Detailed analyses of metagenome assemblies have revealed a new archaeal phylum in microbial mats from Yellowstone National Park (YNP) hot springs. "Previous studies of acidic ferric ion mats from Yellowstone had shown a remarkable diversity of uncultivated, undescribed archaea," said Dr. Bill Inskeep, Montana State University, corresponding author on the current study, which appears in The ISME Journal. "One of our goals was to identify and describe novel thermophilic—requiring high temperature—archaea inhabiting acidic iron-oxide microbial mats in YNP." The microbial mats are chemotrophic, meaning they obtain energy by oxidizing electron donors present in geothermal waters. In this specific case, the mats also oxidize iron, resulting in the production of rust-colored iron oxides. The newly proposed candidate phylum, Geoarchaeota, is represented by a novel archaeal population found in acidic and oxygenated outflow channels of YNP. Replicate metagenome assemblies of the newly described organism appear to bridge phylogenetic gaps among other phyla within the domain Archaea, a group of single-celled microorganisms with no cell nucleus (see sidebar). Why It Matters: The geothermal systems in YNP are field laboratories for scientists who want to understand the origin and evolution of metabolic processes necessary for life in extreme environments. Such microbial communities carry out critical ecosystem services, including carbon fixation and biogeochemical cycling of nutrients and metals, and are being harnessed for studying engineered systems potentially useful for bioenergy and carbon sequestration. The discovery by scientists from Montana State University, Pacific Northwest National Laboratory, DOE Joint Genome Institute, and Indiana University shows the power of metagenome sequencing to discover and characterize previously unknown microbes present in unusual niches. Identification of these novel organisms is critical to understanding microbial community structure and function in thermophilic mats and will give insight to the evolution of Archaea in early Earth environments that may have important analogs in YNP today. Methods: The scientists extracted DNA for metagenome sequencing from iron-oxide microbial mats from YNP's One-Hundred Spring Plain located in Norris Geyser Basin. They performed phylogenetic analyses on the resulting deduced proteins as well as detailed comparative analysis to other known archaea. What's Next: Scientists at Montana State are attempting to cultivate the first member of the proposed phylum Geoarchaeota. In collaboration with scientists at PNNL they hope to develop a better understanding of the role of this organism in iron-oxidizing mats, focusing on its interactions with Metallosphaera yellowstonesis MK-1, the dominant chemoautotroph responsible for fixing carbon in this mat environment. Sponsors: The work was sponsored by the U.S. Department of Energy Office of Biological and Environmental Research Genomic Science Program under the Foundational Sciences Scientific Focus Area at PNNL, the National Science Foundation Integrative Research and Graduate Training Program, the DOE-Joint Genome Institute Community Sequencing Program, and the Montana Agricultural Experiment Station. Research Team: The research team included Mark Kozubal, Bill Inskeep, Ryan Jennings, Zack Jay and Jake Beam, Montana State University; Margie Romine and Lee Ann McCue, PNNL; Susannah Tringe, DOE-JGI; and Doug Rusch, Indiana University. Reference: M Kozubal, MF Romine, RdeM Jennings, ZJ Jay, SG Tringe, DB Rusch, JP Beam, LA McCue, and WP Inskeep. 2012. "Geoarchaeota: A New Candidate Phylum in the Archaea from High-Temperature Acidic Iron Mats in Yellowstone National Park." ISME Journal advance online publication, November 15. DOI:10.1038/ismej.2012.132. Members of the domain Archaea were discovered in the late 18th century but these organisms were not recognized as a separate lineage from the Bacteria and Eukarya until the groundbreaking work by Woese and Fox focused on the phylogenetics of the 16S rRNA gene. In 1990, the newly recognized domain Archaea included the methanogens and halophiles together in the phylum Euryarchaeota, and a second major phylum (Crenarchaeota) that included the first cultured thermophiles in the order Sulfolobales. Since then, considerable progress has resulted in the isolation and subsequent genome sequencing of numerous thermophiles and hyperthermophiles belonging to the Crenarchaeota. Metagenome sequencing now offers opportunities for describing microorganisms before their actual cultivation in the laboratory.